We have consistently heard from our customers—both large and small—that they struggle to keep up with the pace of changes in technology. They feel pulled between the requirement to stay secure and up to date against the need to drive more business value. They are challenged to deliver the great user experiences that employees want and expect. And the sophistication of today’s security threats requires organizations to re-think how they deploy, manage, and secure assets for their users. 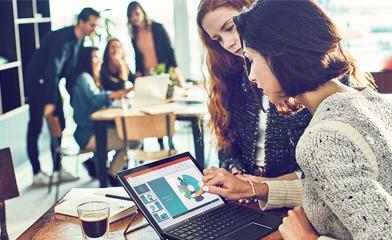 The cloud has dramatically changed the way in which we can deliver, manage, and update devices, which creates an opportunity to think about how we deliver a modern desktop with Microsoft 365 in new and different ways. Great experience with Microsoft 365 on modern devices—Our goal with MMD is to provide a great experience for users while keeping devices secure and up to date. MMD relies on the power of Microsoft 365, running in a consistent, lightweight, reference architecture that continues to evolve to allow our customers to take full advantage of our intelligent security capabilities to protect them from nascent threats. Importantly, MMD is built on modern devices that meet our specification and runtime quality bar. Analytics benefit all customers—Analytics are at the heart of MMD. We leverage analytics to provide operational and security insights and learnings, so we can constantly monitor and improve, as well as enable us to manage the global MMD device population. As an example, we use insights and AI to determine which devices are ready for feature updates or, conversely, whether a specific app is blocking a device’s ability to update so we can act. Customer and partner insight and feedback—Customer feedback and insight are also at the heart of MMD. We have deployed MMD in a measured approach with a set of early customers, leading to hundreds of changes in Microsoft 365 to better enable end-to-end scenarios for customers around the world. We are delighted to be working in partnership with Lloyds Banking Group to deploy MMD, as well as the Seattle Reign FC. These organizations are united by their desire to transform, to modernize the user experience and shift to a modern desktop. They have been partnering with us to learn from, expand, and develop the MMD offering so that we can bring it to more customers and markets in the future. We are also partnering with key strategic partners like Dell, HP, DXC, HCL, Computacenter, and Accenture/Avanade in our MMD journey. We see great opportunities for our partner ecosystem to expand their existing Microsoft 365 activities and provide devices and experiences alongside MMD. Today, we are live with MMD with a small number of customers in the U.K. and the U.S., and are starting operations in Canada, Australia, and New Zealand in early 2019. We will continue to learn from these initial customers and use that insight to evolve and improve both Microsoft 365 and MMD. From there we plan to expand to several other geographies in the second half of 2019. We believe that MMD will be an option that allows organizations to fundamentally shift how they think about and manage their IT. Through MMD, customers will be able to move toward a secure, always up-to-date environment with device management by Microsoft. As we expand the offering, our partners will play a key role in helping us bring MMD to market and support customers in their transition to a modern desktop. We encourage customers who are interested in MMD to contact their local Microsoft account manager as we work to broaden the offering.